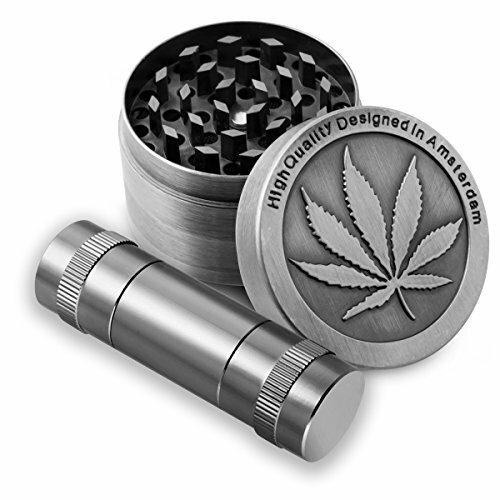 Formax420 Zinc Alloy Herb Grinder Leaf Designed on Top Part 50 mm 4 Piece with Free Pollen Presser and Pollen CatcherQuite heavy and beautiful little herb grinder which made of high quality Zinc Alloy. Ultra sharp teeth cut smoothly and never dull. Work great for a person who likes to travel and do nature hike. one high quality aluminum pollen presser attached. Polished tough Aluminum gray color, Very Light: 3.8oz Net weight and Dimension: 3.5.Two Plastic Dowels, 1.55.suitable for herb and spice and polished that can be used as: Stash safe, Portable Ashtray, Pollen Press and many other creative usages. FOR MORE EXCELLENT PRODUCTS – Please kindly click on “FORMAX420” below the products name.